New OGP Toolbox allows users to track and share digital solutions to make government data more open, democratic and collaborative. The Toolbox includes 22 open contracting tools to help implementers and users of open contracting systems. Current open contracting tools support technical and policy implementation, businesses engaging in e-procurement processes, and public monitoring. Join our community call on 14 Feb to help us understand where gaps lie. In 2016, we saw a dramatic rise in the adoption of open contracting. Over 25 countries committed to open up their public procurement through open data. But more importantly, around half of these governments are actively implementing the Open Contracting Data Standard (OCDS), the open data schema that is at the heart of our plan to unlock and use public contracting data. And there has been a growing number of civil society organizations, journalists and businesses looking at how they can make this data more accessible, usable and shareable. Over the last year, we’ve been asked these questions over and over again: What tools, visualizations, dashboards already exist? Can I use them? Where do I find them? With access to the right tools, publishers can structure contracting data in a way that is comprehensive, timely, links up to other relevant datasets, is tailored to the needs of different user groups and available to anyone. And more people can re-use this data. In this sense, it makes public procurement fairer and more democratic. 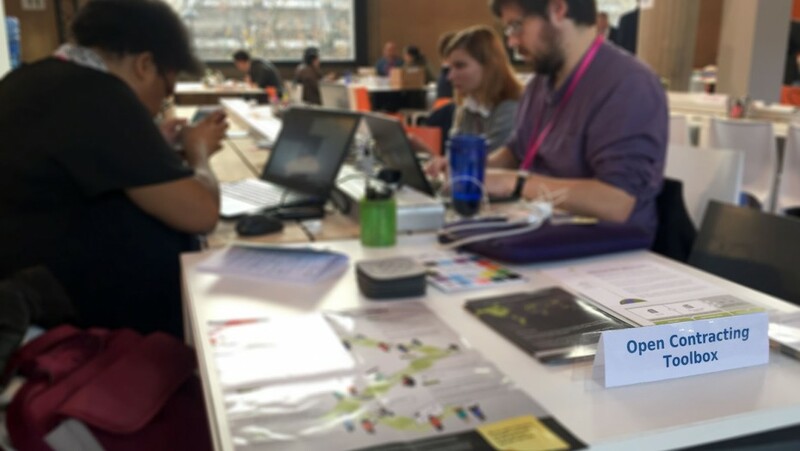 In December, at a huge OGP hackathon with 500 open data geeks in Paris, our team had an opportunity to round up all the best tools for open contracting and open procurement and publish them as a comprehensive tool inventory, as part of a new global platform called the OGP Toolbox. The platform uses crowdsourcing to gather digital tools designed to improve democracy and promote transparency and participation. There are a few reasons the OGP Toolbox was the perfect platform for us. Because it’s collaborative, it lets our community share information about the tools they find most useful and the ways they use them, while also giving access to OCP’s own tools related to the OCDS. And with open contracting growing so rapidly, we need to be able to update the resource regularly as more open contracting tools become available. On the OGP platform, adding a new tool is as straightforward as clicking a button. So there you go. Head over to http://ogptoolbox.org to find all of the tools currently available and let us know if something is missing. Publishing to the Open Contracting Data Standard can require both a policy and a technical commitment. Most of the tools we initially developed focused on supporting the technical aspects and helping developers to validate, flatten, merge, and tabulate OCDS data. But we also needed easy-to-use tools that help those who work on opening up public procurement data but might not have a technical background. We created the OCDS Show: a tool that allows publishers to quickly visualize JSON files in the OCDS format to check the contracting information appears as it should. And we are excited to support the efforts of data management guru Colin Maudry to create a Linked Data Schema for OCDS. You can review and support his work on Github. We very much see our role as building the open contracting field, not being the field, so we look forward to seeing more open contracting data tools like this one. One of the key values of open contracting information is that it levels the playing field for business. Rather than hidden in government basements, it is available for all companies to see, analyse and bid on. Transparency in public procurement is business-savvy. This is why many governments focus on increasing competition as a key target for their procurement platforms. New e-procurement platforms publishing government contracting data in OCDS include ProZorro (Ukraine), DNCP (Paraguay), Ville De Montreal (Canada), and Contracts Finder (UK). Others, such as PWGSC pilot (Canada), offer historical public procurement information to download. Platforms like Open Opps also provide enriched, third-party information on public procurement aimed at business. Open Opps publishes contracting opportunities in OCDS format from 240 publishers in over 60 countries around the world. In Paraguay, a mobile app notifies companies when new opportunities are posted. Governments and civil societies around the world are engaging with open contracting as a way to share procurement information more effectively and efficiently, and are re-using tools for citizen engagement. Many different groups have a vested interest in tracking their governments’ spending and how contracts are executed. Monitoring projects, from Pro-Veedor in Peru to Budeshi turning paper procurement documents to OCDS data in Nigeria, help citizens explore and understand public procurement and demonstrate the possibilities of linking up data by adopting open contracting. What’s next? How can we make these tools work for you? From your feedback, we know some of the tools are hard to adopt even though many are openly licensed. Therein lies an opportunity for open contracting champions to make these tools easier to repurpose for NGOs and other organizations who don’t have the programming skills to make the necessary tweaks. Development Gateway, for example is working on modifying Open Contracting Vietnam and their own red flag monitor to facilitate greater re-use of these platforms. Tools were a major topic at our Open Contracting day at the 2016 International Open Data Conference in Madrid. We learned a lot from your comments during that meeting and through community calls. We know there are gaps in the tools and in our understanding of your needs. So we’ve set up a community call on 14 February to talk about them. Review the collection of 22 open contracting tools. Add your stories and use cases. Suggest open contracting tools we’ve missed. Join our community call on 14 February.